I love making rainbow pancakes! They’re super colorful (obviously) and kids just love them! Usually, about once a week, I make pancakes. It seems like Thursday is pancake day in our house. I will go down to my mom’s and we’ll whip up some buttery golden pancakes. YUM!! Everyone smells like syrup afterwards and sticky hands have to get washed but those pancakes make it so worth it! Now, we never made rainbow pancakes when I was growing up but once when I was prowling through the internet, I came across a post that had these super colorful pancakes. I thought that it was such a cute idea and one that kids would just love – and I was right. :) I made these for my siblings and they just couldn’t get enough of them. So, now on our pancake day, we occasionally will have rainbow pancakes. They are a little bit more work to create but they bring lots of smiles to the kitchen. I will say though that for rainbow pancakes you’re going to want to make sure that your batter is very thin. The thinner the batter is, the better your coloring will show through when the pancakes are cooking… Just a tip. Divide the batter – now, divide the batter up into the number of different colors you are going to dye. If you’re doing red, green, blue, pink and purple you’re going to need 5 different bowls. You can make this easier though and just dye the batter all one color. Or, you could do two colors. Obviously, just do however many colors you want to then have to clean out the bowls. Bake the Pancakes – follow the traditional directions for baking the pancakes. The coloring might differ based on the thickness of the pancake. So, like I said before, make sure that the pancake batter is thin. The color will come through much better. Set out the toppings – Add some cool whip, butter chocolate chips, syrup, strawberries, or blueberries and top your pancakes off with an amazing look. 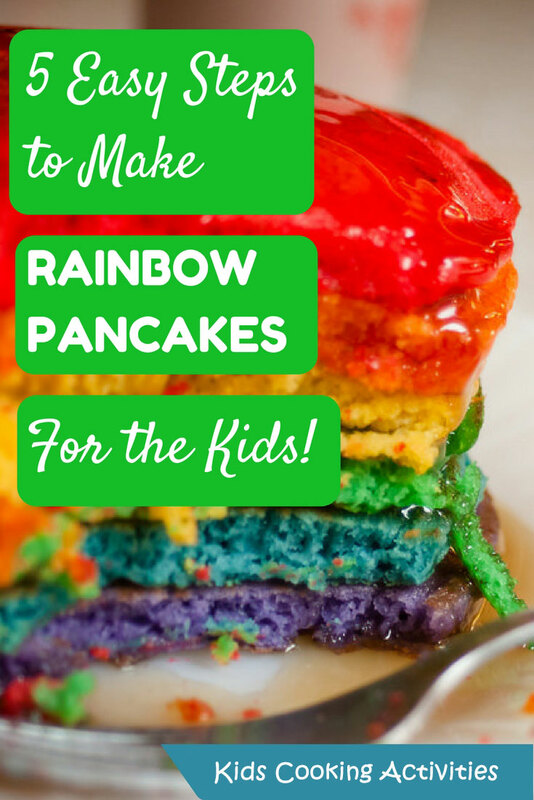 Well, now you can bake up some fantastic rainbow pancakes for your kids' breakfast! It might take you about 15 minutes more than it usually does to make these pancakes so make sure you allot for that time. Anyways, I think you’ll definitely be in the running for the mom of the year award with these amazing creations!